In Protein Primer Part Three, we’re talking about how turkey fits in healthy eating trends and how turkey can power up your healthy plate. What are the top healthy eating trends? Eat real food. Eat clean. Eat more plants. Take a look at any food-focused magazine cover and you’ll likely see one of these statements. Although there’s no single definition for any of these directives, one thing is for sure: eating fewer highly processed, nutrient-poor foods and eating more whole foods is on the radar of health-conscious eaters. What does all this mean for turkey? Turkey fits right in! Where does turkey fit on a healthy plate? Turkey powers up your plate! Dietitians recommend that you fill half your plate with vegetables and/or fruit. A plant-filled plate provides fibre, vitamins, minerals, and antioxidants that you need for good health. Dietitians also recommend that you eat lean protein at every meal along with those vegetables or fruit. Eating protein (hello turkey!) at each meal helps you to feel energized and satisfied (full) for longer after you eat. The small amount of fat in turkey can help your body absorb some of the vitamins and antioxidants (e.g. vitamin E and beta carotene) found in veggies and fruit. Plus, almost half the fat in turkey is monounsaturated – that’s the same type of fat found in heart healthy olive oil! Eating 20 to 30 grams of protein at each meal is what you’re aiming for; one serving (100grams) of turkey provides you with about 30 grams of high quality, muscle-boosting, appetite-satisfying protein. Enjoying turkey with your veggies not only tastes great, but it also helps boost your body’s absorption of the iron found in the plant foods on your plate. Win-win! How can turkey pair with plants on your plate? Deliciously! 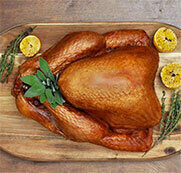 Versatile and nutrient-rich turkey pairs perfectly with all sorts of vegetables and fruits. Here are five sensational salads that feature turkey and other super foods such as kale, apples, peaches and avocado to create satisfying summer suppers. * Per 100 gram serving dark turkey meat is lean, with just 8 grams of fat, white turkey meat is extra lean with just 3 grams of fat and ground turkey is extra lean with just 8.7 grams of fat. Phillips SM et al. Protein “requirements” beyond the RDA: implications for optimizing health. Appl. Physiol. Nutr. Metab. 2016;41:565-572. Slavin J and Lloyd B. Health benefits of fruits and vegetables. Adv Nutr 2012;3:506-516.